Seen here is second creamer printed with a different pattern from the Rural Series. 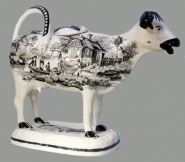 An earthenware cow creamer printed in black with one of the scenes from the Rural Series and with portions also enameled in black. The Glamorgan factory of Baker, Bevans and Irwin produced over 40 patterns in this popular series, typically printed on Glamorgan shaped jugs, mugs, miniature plates, tea wares, and cow creamers like the example shown here. Reference; Helen Hallesy, The Glamorgan Pottery Swansea 1814-1838, pp. 37-41.